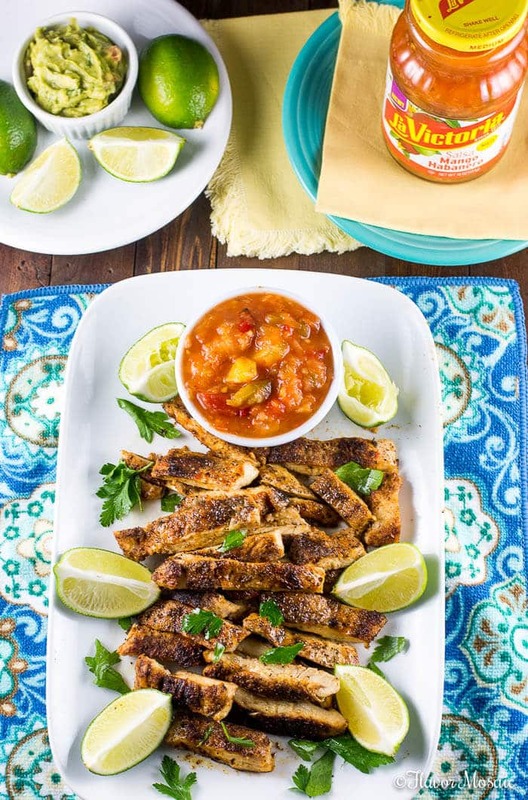 These Blackened Chicken Tacos with Mango Habanero Salsa are filled with the flavor of Cajun Blackened Chicken and the sweet heat of Mango Habanero Salsa. For those familiar with my blog, you know I’m all about fast, easy yet FLAVORFUL recipes! 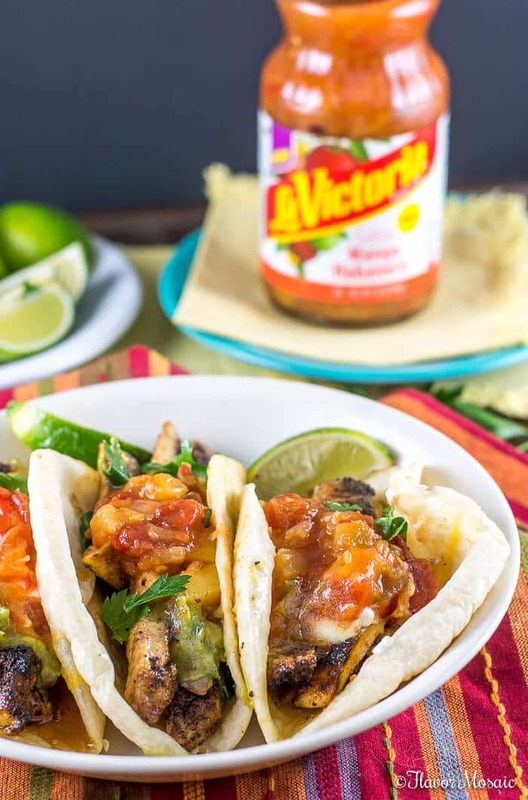 These Blackened Chicken Tacos with Mango Habanero Salsa hit all the right notes, especially because it uses La Victoria® Mango Habanero Salsa, which is loaded with sweet and spicy flavor! I love the combination of mangoes and habaneros as you might have guessed from my Asian Lettuce Wraps with Mango Habanero Salsa, or my Mango Habanero Shrimp Flatbread! Yes. 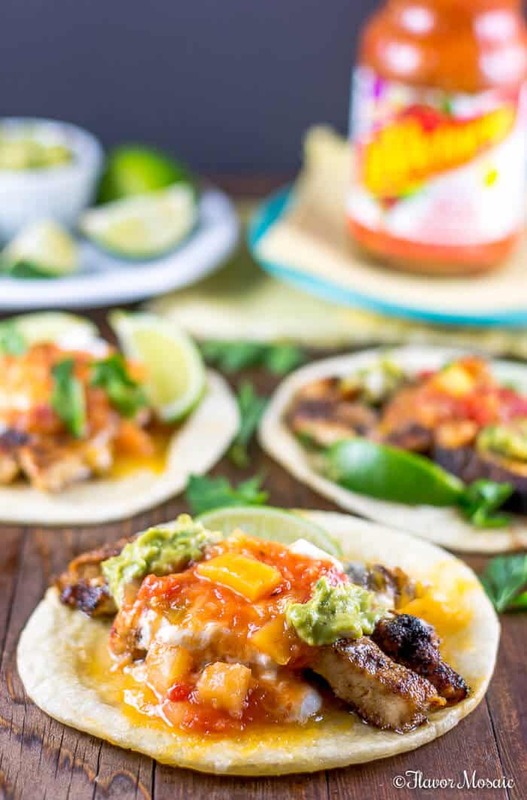 I love the mango habanero flavor combination, which is why I love these Blackened Chicken Tacos with Mango Habanero Salsa! Let’s face it, not all of us are lucky enough to have access to fresh mangoes, or you may not want to handle fresh habanero peppers, or you may be too busy to chop mangoes and habanero peppers to make my pico-de-gallo like homemade Mango Habanero Salsa. That is ok because you don’t have to go to all that effort because instead you can pick up a jar of La Victoria® Mango Habanero Salsa at the store and get all that sweet and spicy flavor without all the work. 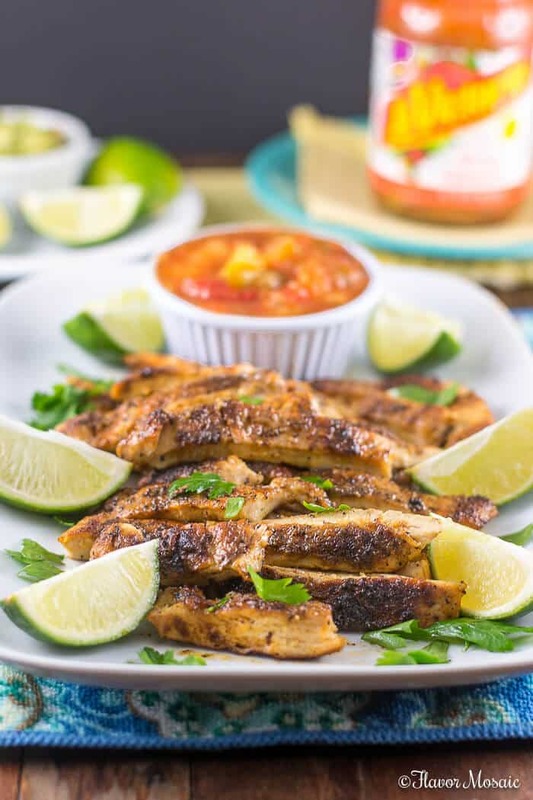 These Blackened Chicken Tacos with Mango Habanero Salsa first start with my popular Cajun Blackened Chicken recipe, which is packed with spicy flavor and is super easy to make. Then it is a matter of including your favorite taco ingredients, such as cheese, cilantro, sour cream and guacamole. But the pièce de résistance is to top it with La Victoria® Mango Habanero Salsa! It is not only delicious, it is colorful as well, making a beautiful presentation that is sure to impress your family and guests. Another ingredient that takes these Blackened Chicken Tacos with Mango Habanero Salsa over the top is having fresh homemade flour tortillas. You can make them yourself, or move to Texas and then you can buy them in almost any grocery store. They really make a huge difference in the flavor of the tacos. THE GIVEAWAY HAS ENDED! Need a new grill? La Victoria® is having a giveaway for a $500 gas grill called “View from My Plate.” They want to see your favorite dish with a view of your favorite spot, whether that is at the beach or on a picnic table! Do this by sharing a photo of your favorite dish on Instagram (or Facebook) with #ViewFromMyPlate, #MangoHabaneroSalsa and tag @LaVictoriaBrand. The grand prize is a Classic Four-burner Gas Grill (valued at up to $500)! Visit La Victoria® to find out all the contest details! 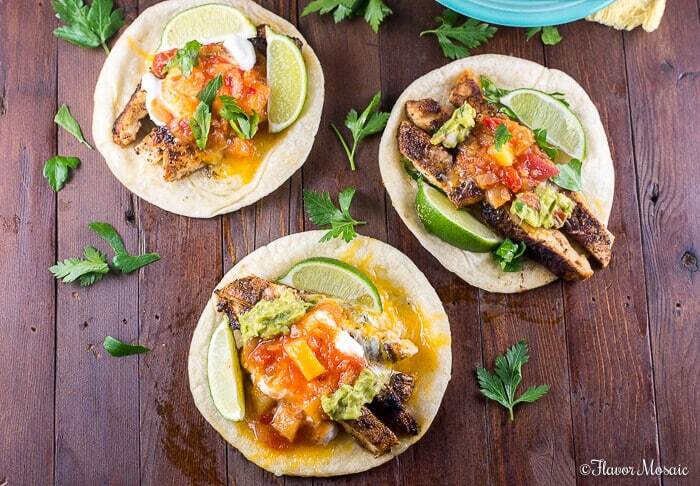 Now it is your turn to make these Blackened Chicken Tacos with Mango Habanero Salsa. Be sure to pick up some La Victoria® Mango Habanero Salsa at the store! 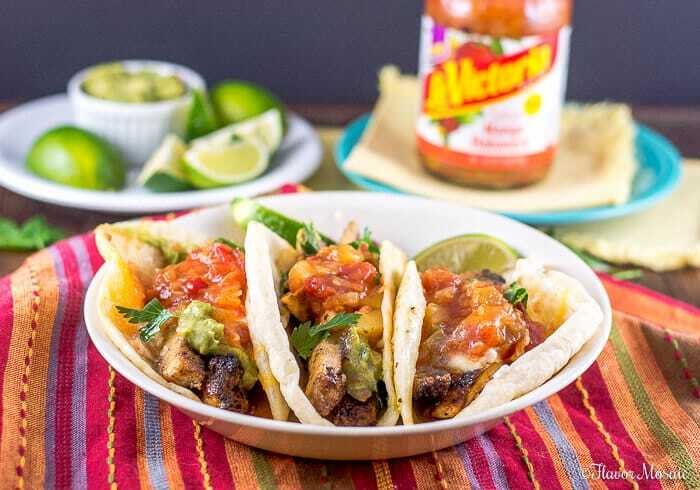 These Blackened Chicken Tacos with Mango Habanero Salsa are filled with flavor with Cajun Blackened Chicken and the sweet heat of Mango Habanero Salsa. Make one recipe of Cajun Blackened Chicken. Wrap the tortillas in moist paper towels and place on a microwave safe plate. Heat for about 30 seconds. Divide the chicken evenly between the tortillas, placing the chicken on top of, in the center, of each tortilla. Sprinkle 2 tablespoons of shredded cheese on top of each taco. Microwave for maybe 30 seconds just until the cheese is melted. 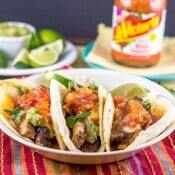 Then divide the La Victoria® Mango Habanero Salsa evenly and spoon on top of each Blackened Chicken Taco. Top each Blackened Chicken Taco with Mango Habanero Salsa with your favorite taco toppings, such as sour cream, cilantro, guacamole. I’m so happy to hear that. Thank you!